Services at B'nai Harim are generally held every other Saturday, with special holiday services added as appropriate. Our services are appealing to Jews who resonate with the varied approaches to worship followed by the Reform Movement over its history. We use the new Mishkan Tefillah to open the doorways to a richer, more meaningful prayer experience. This lovely siddur contains transliterated texts to facilitate ease of participation. Our services are participatory, informative, filled with joyful congregational singing and marked by warmth and decorum. The rabbi provides explanations through divrei tefillah (explanations of prayers) and brief contextualizing commentary, adding meaning to the words of the service. Visitors are never lost; regulars are not locked into rote. Sermons are built upon the Torah Portion of the Week and how it speaks to us as modern American Jews. On most Shabbat mornings we begin at 10:15 after an hour of Intergenerational Learning. Blending English readings with Hebrew prayer and song, we include selections from each section of Shabbat morning worship according to Reform practice. Our Torah readings are sometimes led by lay readers who are given plenty of time to learn the portions. 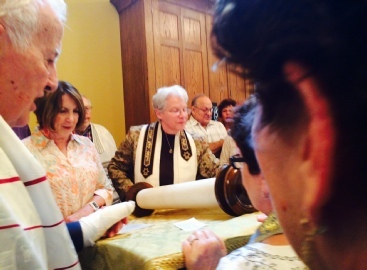 Congregants are called for aliyot, the honor of reciting the blessings before and after the Torah readings. The translations of the week’s selections are read aloud by congregants. Haftarot of special interest are often chanted in Hebrew and in English, giving the flavor of the traditional sound of the passage and adding a layer of instant connection through the chanted translation. Guests are sometimes offered honors during the service if they are comfortable accepting them. Everyone attends b’nai mitzvah services at B’nai Harim because there is a lively interest in the development of our students into young Jewish adults. Students lead or assist in leading much of the service and read from the scroll. After their haftarah, they present a speech in which they explain the significance of the Torah and haftarah portions and tell about the special mitzvot they performed in preparation for their great day.